The research, conducted at the CEU UCH, combines mollecular typology and QSAR methods as faster and more affordable tools in order to obtain new medicines and challenge the growing appearance of bacterial resistances. Bacterial resistance to known antibiotics has turned into a severe threat to public health due to the bad use of these medicines in humans and animals. To the extent that the WHO projects that in 2050 this will be the main cause of death among the population worldwide, surpassing cancer. 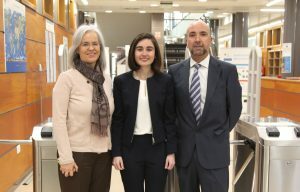 Research conducted by the Department of Pharmacy of the CEU Cardenal Herrera University of Valencia has led to the designing and developing of models to predict antibacterial activity in order to obtain new antibiotics in a quicker and more affordable way, to help challenge the decrease in investments on behalf of the pharmaceutical industry in this field. Specifically, in the research of doctor Suay under the guidance of CEU UCH professors Pérez Gracia and Alemán, three mathematical-topological models have been designed for the prediction of bacterial activity in a group of antibiotics known as quinolones, when faced with two types of bacteria chosen for the study: Escherichia coli, the main cause of hospital infections, and Staphylococcus aureus, which is resistant to methicillin (SARM). Another contribution of the thesis of Beatriz Suay is that her methodology enables the repositioning of medicines which are already commercialised with other purposes as antibacterial agents, which requires an investment ten times lower than that needed to develop a new antibiotic from scratch. As Suay explains, “we have studied a database with compounds with structural diversity, of which we chose 11 that were already commercialised, as well as a virtual combinatorial library of a thousand quinolones, from which two new ones were synthesised through an in vitro test of their antibacterial activity.” One of the commercial compounds studied, thiomorpholine, turned out to be active against one of the analysed bacteria: Escherichia coli. Furthermore, the two new synthesised quinolones have shown a broad range of antibacterial activity, comparable to ciprofloxacin. These results also validated the predictions of the models designed in this same research to detect compounds with antibacterial activity. The researcher has also included the finalising of the Galleriamellonella larvae model for its application to the in vivo toxicity trials of new medicines. “The two quinolones synthesised in this research turned out to be harmless at the highest doses studied with this method, which confirms its potential as new antibiotics, for future in vivo studies of activity and toxicity,” highlights the research author. The examining board, which awarded the thesis of Beatriz Suay the highest academic mark at the CEU UCH, was comprised of doctors Ramón García (Valencia University), Mercedes Medio (University of Valencia), José María Eiros (University of Valladolid), Gerardo Antón (CEU UCH University) and Antonio Falcó (CEU UCH Unviersity). During the defence of the thesis, the members of the examining board highlighted both the statistical methodology employed as well as the interdisciplinary nature of doctor Suay’s research at taking on a global health challenge: the search for new antibiotics, to which the pharmaceutical industry has ceased allocating resources.